Say goodbye to cookie-cutter homes. As a kid, you probably heard the story of the three little pigs. To recap the tale: Three pigs build homes out of straw, sticks, and bricks respectively. In the end, only the brick house is able to withstand the huffing and puffing of the hungry neighborhood wolf. The moral here? Hard work pays off. But, in our future-oriented fable, there was a fourth pig. A pig that went all out, and built his house using a state-of-the-art 3D concrete printer – preserving a ton of energy, and reducing overall waste in the process. No amount of huffing or puffing could flatten it. And he barely had to lift a hoof. 3D printing is becoming a staple in a vast number of different industry applications — from liquid metal fixtures for spacecraft to 3D printing living tissue. As our pig metaphor illustrated, it’s even possible to build entire houses using massive, industrial-scale 3D printers – but they have yet to gain permanent inhabitants. That’s all about to change. A Dutch construction company called Van Wijnen is 3D printing the first homes in the world that are actually habitable (i.e. able to pass a home inspection) — at least so they claim. 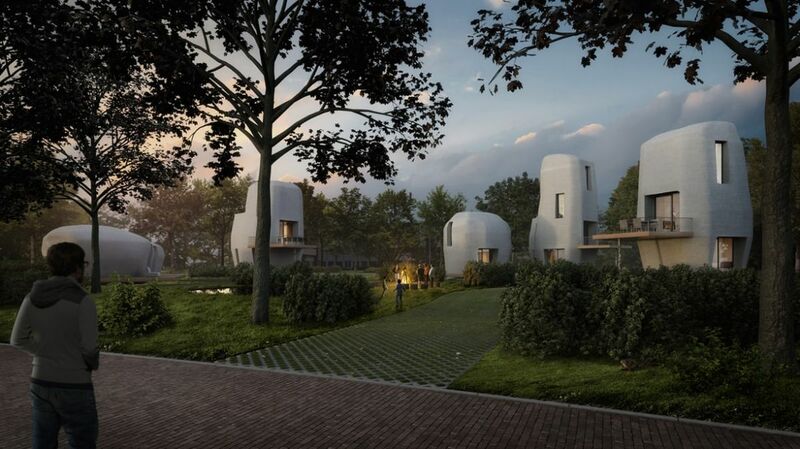 Dubbed Project Milestone, the futuristic homes will be 3D printed near the city of Eindhoven. Currently, there are five houses in total, each with a unique shape and size that shows off the flexibility of the cutting-edge tech. Since the printer is essentially a giant concrete nozzle that moves along a two-dimensional track high up in the air, architects are able to design homes in pretty much any shape they like. Right now, the homes are printed in pieces off-site, then transported to their final destination. Towards the end of the project, the team hopes to make further adjustments by bringing the printer on-site. In all, this results in a more streamlined process – especially considering that a cumbersome brick and mortar structure can take more than six months to complete. The simplified assembly isn’t the only advantage 3D printing has to offer over conventional building methods. The process requires less workers, keeping costs down and accidents to a minimum. Further, the amount of cement, and transportation required are kept to a bare minimum, reducing the environmental impact. Van Wijnen’s futuristic vision is just of many projects around the world using 3D printing to build unique houses. Austin-based startup ICON developed a way to print a 650-square-foot bungalow for just $10,000, while a San-Francisco-based startup managed to construct a house within just 24 hours. But the technology behind 3D printing structures is still emerging, and some of its touted advantages may be exaggerated. The variability of cement-based materials raises questions about their structural integrity, and environmental impact. How do specially formulated cement mixtures affect air quality or biodegradability? More research has to be done to fully deem 3D printing technology a success. But one thing is clear: there is a ton of excitement and cautious optimism behind the technology, and that’s bound to have a spillover effect on conventional construction methods. However, it’s unlikely these conventional methods will be entirely replaced right away — it’s far more likely 3D printing will be extending, and modifying the way we build homes in the near future. Besides, who wouldn’t want houses to be safer, more environmentally friendly, and cheaper to build?